Bodyguard Premium Mosquito Repellent Patches by Sirona are natural anti-mosquito patches that keep mosquitoes at bay. These are safe for all age groups, including children. 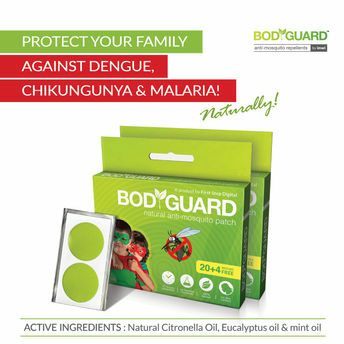 These are DEET free, contains no harmful chemicals & are perfect for indoor & outdoor activities. Generally effective for 12 hours. Perfect for indoor and outdoor activities. Additional Information: A one of its kind, Sirona is India's First Intimate Hygiene Care Brand founded by Deep Bajaj, his brother Mohit Bajaj and their friend Rahul Anand. Their mission being, to revolutionize the way women travel in India and make female hygiene products accessible for women who are independent and want to explore the world freely. Some of their products are Disposable - Female Urination Devices, Tampons, Disposal bags for sanitary products, Intimate Wet Wipes, Under Arm Sweat pads etc.